I was lucky enough to be at mission control in Moscow's Star City when the Russians launched the first stage of the International Space Station (ISS). They called it Zarya, which means Dawn. The enterprise itself was meant to be just that - a new dawn for human space exploration. Moments after the launch, the then head of Nasa, Dan Goldin, said: "Within a few years, the brightest star ever will appear in the sky." He said it would be a sign of hope because nations who had once fought each other had now come together to use their ingenuity, not to blow up humanity, but to make a better world. But 10 years on and it is still not completed. It is tens of billions of pounds over budget and the limited science that has been carried out on board so far, according to Dr Andrew Coates of the Mullard Space Science Laboratory in Surrey, has been distinctly mediocre. 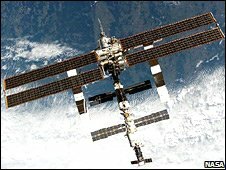 He said: "The International Space Station has been a big waste of time and money over the past 10 years. It's 240 miles above our head and that's hardly real space exploration." Even though the ISS is still unfinished, it may have already become an outdated idea. The US space agency's new focus is to return to the Moon, Mars and beyond. Nasa's current administrator Mike Griffin does not seem to be a fan of shuttling his astronauts back and forth to low earth orbit in order to carry out experiments such as growing crystals or watching how ants behave in zero gravity. For him, these are hardly deeds that compare to the epic Moon missions that once stirred his blood. So what has been the point? The primary purpose of the project, from the outset, seems to have been political - to make the Russians feel loved and give the American space industry something to do. 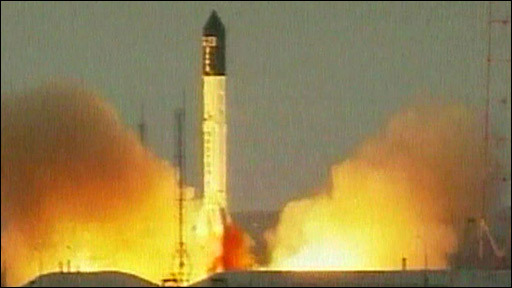 The Soviet Union had recently crumbled and the US felt that it was important to place construction orders with the Russians - there were fears within the US administration that Soviet-era rocket expertise might otherwise be put to use making arms for rogue states. For its part, the US could no longer afford to go to the Moon, but congress felt it needed to continue to be a space faring nation. So in terms of domestic and foreign policy goals, the space station may be considered a success. 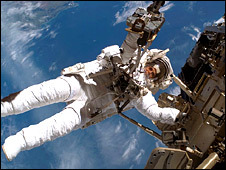 According to Dr Chris Riley, a leading space film maker and journalist, the ISS is also a symbol of international co-operation. He said: "For the past 10 years, you've had nations that were once fighting each other working together for a big peaceful international endeavour." "And they've created a space station that is a permanent human presence beyond the Earth's atmosphere - and that's something to celebrate." And according to Dr Ian Crawford, of Birkbeck College, it has helped build the skills that will be needed to push out again to the Moon, Mars and beyond. "The legacy of the International Space Station is likely to be the experience we've developed to build structures in space in a collaborative way," he said. "When it comes to planning future international expeditions back to the Moon, for example, we can build on what we've learned from building the ISS." I don't know what happens in the space station, however I do recognise the importance of space exploration and travel. 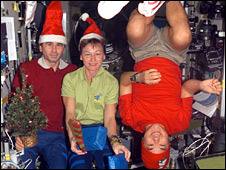 Critics, however, say that despite the experience gained, the space station was a wrong turn. They believe that Nasa, which had once reached for the stars, had set its ambitions too low. And, to subvert a phrase from the man who sent the US to the Moon - John F Kennedy - Nasa, Russia and the world's space agencies wanted to build the International Space Station, not because it was hard, but because it was easy.